Tirtha Empul Temple (Indonesian: Puru Tirtha Empul) is a Hindu temple in the middle of Bali Island, Indonesia, famous for its Holy water where Hindu Bali people go for purification. In Pura Tirtha Empul, you will find bathing pools of natural spring of water with archetype designs of Old Balinese style. The springs bubble up into a large, crystal-clear tank within the temple and gush out through water sprouts into a bathing pool. 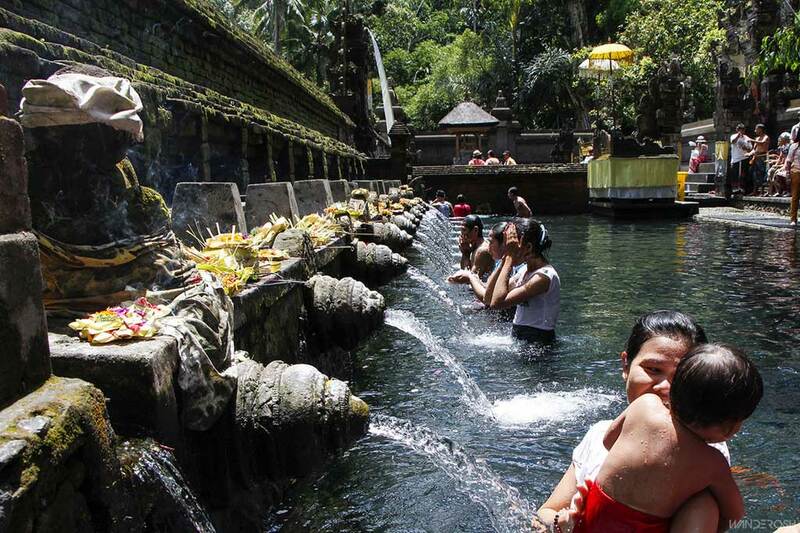 Before praying to the shrines of Tirtha Empul, the participants will dip themselves into the pool of natural spring water. Gunung Kawi is an 11th century temple complex in Tampaksiring north east of Ubud in Bali, Indonesia. It is located on the river Pakrisan. The complex comprises 10 rock-cut candi (shrines) carved into the cliff face. They stand in 7m-high (23 ft-high) sheltered niches cut into the sheer cliff face. These monuments are thought to be dedicated to King Anak Wungsu of the Udayana dynasty and his favourite queens. The former kingdoms of the past erected many monuments to commemorate the presence of the sovereign chosen individuals in the history of Bali, Java and Nusantara – Indonesia, the spiritual path attunement in Gunung Kawi favorably suggested the path of meditation and feel the vibration of the other benevolent dimension channeled through you, succeeded by prayers in Hindu.